A swath of corn on the cob, shrimp, sausage, mussels and new potatoes spilled across my Facebook news feed recently, so luscious-looking I almost could taste it. The feast, served on newspapers at a picnic table, was the work of Mitch Allen, head honcho of Mimi Vanderhaven. Not only does he publish my newsletter, he is such a good cook he could write it himself. Of course, I immediately snatched his idea of a Low Country feast and served it to friends a week later. 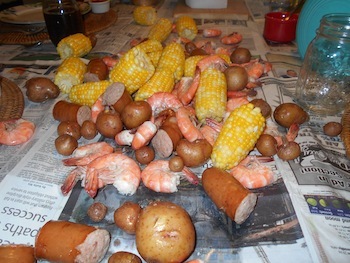 A seafood boil is an easy, fun way to entertain. The entire meal is layered in a big kettle, boiled with spices, then drained and spread the length of a table. Diners dig in with their hands. Mitch is from Georgia, so Low Country cooking is second nature to him. The coastal areas of South Carolina and Georgia are a lacework of inlets and islands where shrimp, crabs, fish and oysters are abundant. The historic region developed its own style of cooking – part Southern, part coastal — with such iconic dishes as she-crab soup, Frogmore stew and Low Country Boil. Because my visiting friends are Northerners transplanted to Georgia, I wanted to introduce them to a folksier style of eating than the sophisticated foods they enjoy in Athens and Atlanta. And boy, is this meal folksy. Doris couldn’t understand purpose of the newspapers, but they’re there to protect the table (along with an under layer of plastic) and to make cleanup easy. At meal’s end, shells, cobs and unwanted leftovers are just rolled up in the newspapers and deposited in the garbage. Ingredients and seasonings vary from recipe to recipe. I used kielbasa (any smoked sausage will do), tiny new potatoes, fresh corn and large shrimp in a mixture of beer and water. The seasonings were crab boil (whole spices sold in a net bag) and Old Bay, both available near the seafood department of most supermarkets. The ingredients are added to the pot according to how long they take to cook. The potatoes and sausage go first. The shrimp are added for the last two minutes or so of cooking. In this way, nothing is overcooked. Iced tea and beer go best with this meal, I think, although I also had Champagne and sauvignon blanc on hand. You could throw in some cornbread, I guess, although the boil was enough for us. This is the type of meal that encourages long, relaxed conversations, perfect for old friends who want to reconnect. “Seriously, what have you been doing?” Doris asked after we had finished eating. Or the mansion, the TV show or the publishing empire. Otherwise, exactly. Mitch says big pots may be rented, along with outdoor propane cooking gizmos. I used the top part of my lobster/crab steamer (it has a perforated bottom) set into a larger pot Tony uses at the restaurant. Mitch also suggests putting plastic garbage bags under the newspapers to protect the table. I used a wide length of plastic that Tony buys by the roll at the hardware store. Fill a very large pot halfway with water. Add beer, crab boil seasoning and Old Bay. Bring to a boil. If you have a large steamer insert, place in pan of boiling water. Otherwise, lower ingredients directly into the large pot and drain them later. To the boiling water and beer, add the potatoes and sausage, cover and boil slowly for 10 minutes or until potatoes are almost tender. Break corn cobs in half and add to mixture. Cover and boil for 5 minutes. Add shrimp in shells, cover and boil 2 to 4 minutes, depending on size, or just until cooked through. Immediately remove steamer insert and drain. Or carefully dip out and drain ingredients, discarding liquid. Dump on a table covered with plastic and newspapers. Provide plates, utensils and plenty of napkins for diners. Serve with hot sauce and cocktail sauce, if desired. Serves 4. In late summer, you’re apt to throw together a fresh tomato sauce or chunk up dead-ripe tomatoes to simmer in ratatouille. Then in late September, you wonder why your cookware has turned gray. The acid in tomatoes can discolor aluminum and copper pans. Acid also reacts with cast iron, although you won’t see a discoloration. Light-colored foods cooked in the pans may become streaked with gray, however. Stainless steel, tin-lined copper, enameled cast iron, glass and ceramic cookware are non-reactive. Aluminum, unlined copper and cast iron are reactive metals. Unfortunately, the latter three are also the best conductors of heat. Manufacturers have gotten around the problem of acid corrosion by coating the pans with non-reactive metals or other substances – non-stick coating for aluminum, tin coating for copper and enamel for cast iron. In addition, some manufacturers of aluminum cookware treat the metal electro-chemically to produce anodized aluminum, which will not react with acids. If you have plain aluminum pans that have gone gray, and if the color bothers you, mix 1 tablespoon cream of tartar or lemon juice with 1 quart of water. Make enough of the solution to fill your pan. Boil for 10 minutes or until the discoloration is gone. Until someone convinces me otherwise, I am transferring the local Best Burger crown from The Rail at Summit Mall in Fairlawn, my former flame, to the Wolf Creek Tavern in Norton. The Rail’s jumbo, hand-patted Ohio beef burgers still can rock my world, as can the burgers at the former Beacon Journal champ Louie’s in the North Hill area of Akron. But Wolf Creek’s hamburgers truly are the stuff of dreams. For starters, they are so gigantic – three-fourths pound for the Tavern Burger and a half-pound for the others – that they provide me with three meals. Second, they are tender, juicy, well seasoned and topped with an enticing assortment of goodies, from root-beer- braised onions to peppered bacon. It’s a hell of a hamburger. Wolf Creek Tavern (the former Loyal Oak Tavern) is at South Cleveland-Massillon and Wadsworth roads, phone 234-571-4531. The website is http://www.wolfcreektavern.com. Well, we traded another quarterback who ends up as a starter elsewhere (Brian Hoyer for the Texans). And now Manziel has hurt his elbow. How much more can Browns fans take? Yo, Dave: I think you have the wrong blog. I’m running your letter anyway, though, because none of my readers sent me questions, tips, gripes or observations this week. Not one stinkin’ email. Why do sports bloggers get all the feedback? Even on perfect summer days, when my readers are busy elsewhere with picnics and café dinners, the sports guys natter on. Just kidding. Dave didn’t send me an email. I made that up. The rest of it is true, though, so put down that ice cream cone and drop me a line for cryin’ out loud. Please tell your friends about my blog site (https://janesnowtoday.wordpress.com/), where you can find not only each week’s newsletter but archives of past newsletters.